The Artistic Academy of Hair Design supports the Family Educational Rights and Privacy Act and insists that any requests from third parties for access to student records fully conform to the FERPA requirements. FERPA generally requires that prior written consent be provided by the current or former student prior to education records or information being disclosed to a third party, including criminal investigators. 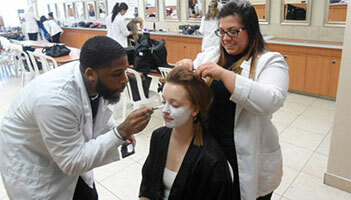 The Artistic Academy of Hair Design defines “attendance” as the first day the eligible student actually begins classes. What are the basic FERPA concepts? Schools must have written permission from the eligible student in order to release any information from a student's education record. A student has the right to inspect and review the student's education records maintained by the school. The student must provide a written request to the administration and the review of said educational records will be conducted within 45 days of receipt of request. Authorized personnel must be present while the student is reviewing his/her file. Schools are not required to provide copies of records. Schools may charge a fee for copies. Eligible students have the right to request that a school correct records which they believe to be inaccurate or misleading. The student must forward a written statement to Darlene Fox, Director, requesting a correction. The school reserves the right to request additional information to substantiate the request. If the school decides not to amend the record, the parent or eligible student then has the right to a formal hearing. After the hearing, if the school still decides not to amend the record, the parent or eligible student has the right to place a statement with the record setting forth his or her view about the contested information. However, while the FERPA amendment procedure may be used to challenge facts that are inaccurately recorded, it may not be used to challenge a grade, an opinion, or a substantive decision made by a school about an eligible student. FERPA was intended to require only that schools conform to fair recordkeeping practices and not to override the accepted standards and procedures for making academic assessments, disciplinary rulings, or placement determinations. Thus, while FERPA affords eligible students the right to seek to amend education records which contain inaccurate information, this right cannot be used to challenge a grade or an individual's opinion, or a substantive decision made by a school about a student. Additionally, if FERPA's amendment procedures are not applicable to an eligible student's request for amendment of education records, the school is not required under FERPA to hold a hearing on the matter. A parent who has claimed the student as a dependent on the parent's most recent year's income tax statement; or should there be a health or safety emergency; or should the school determine there be a violation with regards to use or possession of an alcohol/controlled substance and the eligible student is under the age of 21. There are other exceptions. Conditions specified in the FERPA regulations at 34 CFR § 99. 31 have to be met before a school may non-consensually disclose personally identifiable information from education records in connection with any of the exceptions mentioned above. Educational records are directly related to the student and maintained by the school or by a person or entity acting for the institution. Educational records include: Student GPA and transcripts, admissions and financial aid records, disciplinary record, attendance records, academic counseling records. They do not include: health records of an eligible student that are made and maintained or used in connection with the treatment of the student and disclosed to individuals providing treatment. Schools may disclose, without consent, "directory" information such as a student's name, address, telephone number, date and place of birth, honors and awards, and dates of attendance. However, The Artistic Academy of Hair Design does participate or distribute “directory information. Schools must notify eligible students annually of their rights under FERPA. The actual means of notification (special letter, inclusion in a PTA bulletin, student handbook, or newspaper article) is left to the discretion of each school. Should TheArtistic Academy of Hair Design be presented with a subpoena to provide student records, FERPA does not require an eligible student’s consent, but it does require the school to make a reasonable attempt to notify the student of the subpoena in advance of compliance. The Artistic Academy of Hair Design will make every effort to notify the former or current student in advance of the school’s compliance to any lawfully issued subpoena. The USA Patriot Act, which focuses on anti-terrorism, does allow law enforcement agencies, with appropriate approvals from a court, to require that the student not be notified and that the institution not announce or confirm to anyone that the student’s records have been requested. Who does not have FERPA rights? If an eligible student believes that a school has violated or failed to comply with FERPA, the student may complete a FERPA complaint form. A timely complaint is defined as one that is submitted to the Office within 180 days of the date that the complainant knew or reasonably should have known of the alleged violation of FERPA. Complaints that do not meet FERPA's threshold requirement for timeliness are not investigated. The complaint should include the following specific information: clear and specific allegation with supporting documentation relevant to the allegation, dates, names and titles of the school officials or third parties involved. Should an eligible student or parent have questions regarding FERPA Act, please contact (973) 656-1401 ext. 216. Artistic Academy has fully prepared me to be in the salon. I’m excited and confident in the knowledge I’ve gained from my educators. The teachers make your learning experience feel like a team effort. Coming to Artistic Academy was definitely one of my best decisions! Using their artistic vision and skills, students work cooperatively to express their creativity with a predetermined theme. 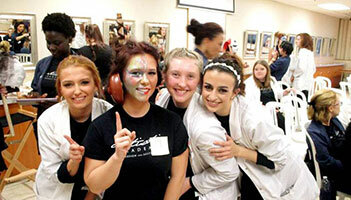 Impromptu competition...at Artistic Academy of Hair Design, it’s always a possibility! 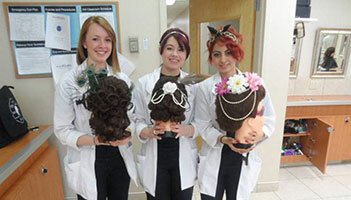 Students celebrate the 18th century by recreating era-appropriate hair styles and make up. Artistic Academy of Hair Design is a 14,655 square ft facility which provides a pleasant and spacious atmosphere conducive to the art of learning.